A tiny parish in northeast Norfolk, Brandiston comes from the Old English meaning ‘farmstead belonging to Brant’. So far no archaeological evidence of prehistoric, Iron Age or Roman settlement has been found in the parish. In Domesday Book, Brandiston is listed as a tiny settlement, whereas the settlement of Guton was relatively larger, with woodland, a mill and beehives. 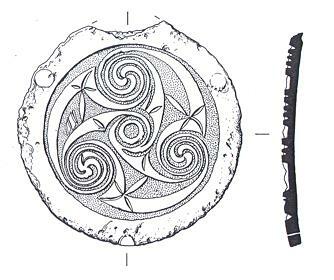 Guton (NHER 14897) has now entirely disappeared, and its exact site is unknown although it may have been located in the area around Guton Hall (NHER 41260), close to where part of a Early Saxon hanging bowl (NHER 30995) has been found. Guton Hall itself was built in the early 20th century, after the old Hall was destroyed by fire. St Nicholas’s Church (NHER 7473) dates from the 12th century, with substantial later medieval alterations, and contains reused Roman bricks. Brandiston Hall (NHER 7439) is a 17th century building, thought to have been built on the site of a medieval hospital belonging to Mountjoy Priory in Haveringland (NHER 7754). A medieval ring and seal matrix have been found on the site. During World War Two, an airfield (NHER 7465) was constructed at Brandiston, and some of its runways and buildings still survive. Sarah Spooner (NLA), 17 August 2005.